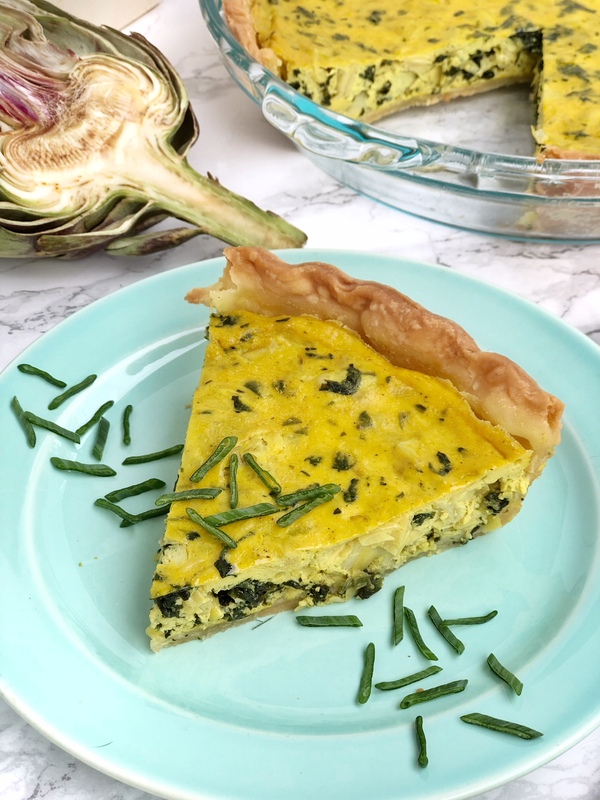 Spinach and Artichoke Vegan Quiche - Are You Kitchen Me?! A classic brunch staple gone vegan! 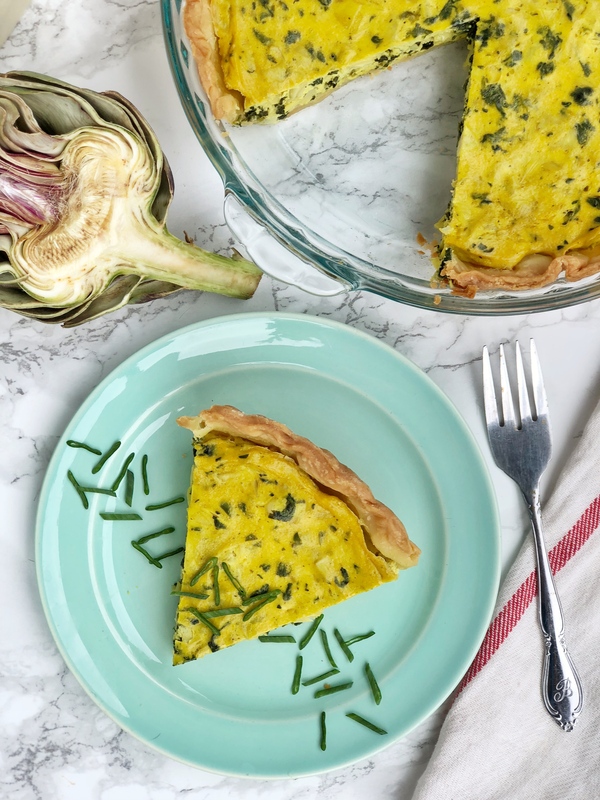 Spinach and Artichoke Vegan Quiche is the dish your plant-based breakfast has been missing. Growing up, I wasn’t a huge fan of quiche. Or really any pie for that matter. I mean, I could eat pie crust (NEVER graham cracker) all day long, but fillings? Savory ones? Heck no. And when you think about it, ‘savory egg pie’ sounds pretty strange. But I guess I don’t care how it sounds because what l learned to love was the taste. 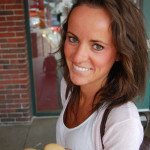 I discovered my love for quiche only shortly before going vegan so the affair was short lived. It had been years since I’d laid mouth on the eggy tart but when I saw some recipes for a vegan option, I was intrigued. I read that all it took was a little blended tofu so I set off on an experiment for vegan brunch paradise. If you’ve been vegan or enjoy eating plant-based meals you’ve probably at least heard of tofu scramble. You know, tofu all crumbled up and sautéed with veggies and turmeric to look like eggs. We eat a lottttt of tofu scramble in our house. So making the switch to blending up the tofu with our typical scramble spices for a new no-egg texture wasn’t a big leap. The key ingredient to getting a truly “eggy” taste from your quiche is black salt, or kala namak. This particular salt is harvested form sulfuric salt mines and has a very distinct egg-like flavor. I buy mine for super cheap at a local Indian grocery store but I know you can get it on Amazon too. I trust you can use your resources. So, who’s coming over for (vegan) brunch this weekend? A classic brunch staple gone vegan! 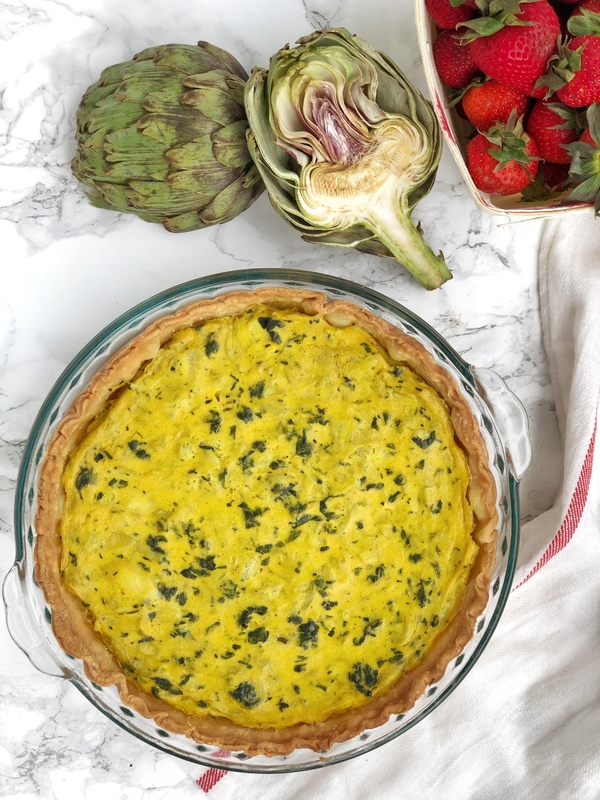 Spinach and Artichoke Vegan Quiche is the dish your plant-base breakfast has been missing. Preheat over to 350F. Prepare your pie crust according to package or recipe instructions. Press it into a 9-inch pie pan, crimp the edges, and set in the fridge while you prepare the filling. Place the thawed spinach in the middle of a tea towel or dish cloth and squeeze all of the excess liquid out. Repeat with the artichoke. Place both on a cutting board and roughly chop into small pieces. In a blender, add the tofu, milk, and all of the spices. Blend on high speed until completely smooth. In a large mixing bowl, combine the tofu mixture, spinach, and artichoke. Pour into the crust and smooth out with a spatula. Bake for 35-40 minutes, covering the pan with foil after 15 minutes so the crust doesn’t burn. Let cool slightly before slicing and serving. I’ve only had tofu cooked to mimic eggs once before and I was very impressed. I would love to try this! This recipe is genius! I loooooove quiche but sometime have an autoimmune reaction to eggs, so this is seriously perfect. Also – growing up in my Indian house, we used kala namak in a TON of recipes – it’s such a great finishing salt! This recipe is really awesome, healthy and delicious!